These times we are living in are unprecedented in our lifetimes in terms of the amount of chaos, turmoil, upheaval, and shaking that is taking place in nearly every segment of society. With nearly constant threats of violence, terrorism, hatred, protests, riots, and the like, it is difficult, to say the least, to find a place of peace. Natural disasters seem to be increasing as well; nowhere seems safe anymore. Yet Jesus clearly warned us that times like this would occur, “I have told you these things, so that in Me you may have peace. In this world you will have trouble. But take heart! I have overcome the world.” (John 16:33) This, and other warnings He gave, were not meant to put us in fear, but to prepare us so that we would not be blind-sided and panic. Realize God knows everything. He knew this would happen, so He’s not surprised at all. He is not fretting or wringing His hands or worried. He has a plan and it is good, because He is. Though He doesn’t control everything, He is still on the throne and will always be. (See my article, Is God Really in Control? for my views on that topic). Understand that it is only in Him we will find peace. He is our peace. He is our place of rest, safety, and protection. He is with us, in us, and for us, therefore who can really be against us? We find peace in His nature, that in spite of trials and troubles, He is good and always has our best interest at heart. He works all of the circumstances of life together for our ultimate good. He may not keep us from trouble, but He walks through it with us, and will never abandon us. Know that the world and its ways will bring trouble. The spirit of this age is violently opposed to God and His ways. Jesus told us that the world hated Him, and would also hate us. (John 15:18) James said that friendship with the world meant hatred towards God. (James 4:4) To expect otherwise is to deceive ourselves. Jesus tells us to “take heart,” meaning, to be of good cheer; be of good courage; to be bold in the face of troubles! How can we be bold in the face of persecution, hatred, and violence? By knowing He has overcome this world. He was subjected to the worst possible violence, persecution and hatred. He was even betrayed by those closest to Him. He endured the greatest injustice of human history, yet He overcame it because of His love for us. Because He conquered every foe and came out victorious, so will we! The more we meditate upon God’s nature as seen in His Word, the more we will know Him as He really is. Many in the Church still view Him as angry, vengeful, nit-picking, and perfectionistic. Too often He is believed to be judgmental, displeased, and disgusted with us in our weaknesses and failures. These ungodly views do not facilitate peace in our relationship with Him. We must get healed and free from these ways of seeing Him if we ever hope to have peace in our lives. The more we know Him, the greater our peace in the midst of any storm. As a believer for forty years, I’ve heard many interpretations and teachings on the full armor of God. It is a subject that many are familiar with. The main passage of Scripture that speaks of it is found in Ephesians 6:10-17. Most have turned it into a mental exercise where one visualizes “putting on” each piece of armor every day. The reason being, this is supposed to keep one safe from enemy attacks, almost like a magic charm or something. Frankly, this is a labor of futility. Not only does it not work, but it also misleads people into believing that going through the motions of this operation can protect them, rather than how they choose to live each day. I do not believe this is what Paul had in mind when he wrote this passage, as inspired by the Spirit of God. When interpreted in context, as all interpretations should be, the armor of God is, in essence, the nature of Christ. The first piece, the belt of truth, speaks of Jesus who said He was, “the way, the truth and the life.” (John 14:6) This means that we should walk in truth in every area of our lives. Since satan is a liar and the father of lies (John 8:44), truth will always defeat him. The second piece, the breastplate of righteousness, speaks of Christ’s righteousness which is credited to us at salvation (Phil. 3:9), He, Himself, is our righteousness. The third piece, the shoes of peace, speak of being a peacemaker (Matt. 5:9, James 3:18), and also walking in the peace of God. Jesus is called the Prince of Peace (Is. 9:6), the gospel is to restore peace between God and man (Luke 2:14, Col. 1:20). The fourth piece, the shield of faith, speaks of our faith in Christ which helps us overcome (1 Peter 1:5, 1 John 5:4). The fifth piece, the helmet of salvation, speaks of the protection of our soul (mind, will, emotions) that comes from the hope and meditation of our salvation (1 Thess. 5:8). The sixth, and last piece, the sword of the Spirit, speaks of the Word of God, which we use to refute the lies of the enemy (Heb. 4:12, Rev. 2:12, 2:16, 19:15). Jesus used the Word to defeat the enemy in the wilderness (Matt. 4:1-10). It is our offensive weapon. Finally, it is striking that Paul uses the word “stand” four times in verses 11, 13, and 14. This word literally means, “be kept intact, to escape in safety; to uphold or sustain the authority or force of anything; to stop, stand still, to stand immovable, stand firm; to be of a steadfast mind; of quality, one who does not hesitate, does not waiver.” This describes what our position should be when faced with the enemy. We do not fight, but rather stand, clothed with the nature of Jesus, in His authority which is above all authorities. We remain immovable and unshakeable for greater is He that is in us, than he that is in the world. I wrote briefly last week about a recent season of adversity I’ve been (and still am) going through. As I said in that short article, I’ve been processing what God has been showing me so that it might provide insight for others in difficult situations. Of course, I also expect to gain greater understanding of what He’s doing in my life. The next verse He brought to mind was Ephesians 6:13, “Therefore put on the full armor of God, so that when the day of evil comes, you may be able to stand your ground, and after you have done everything, to stand.” There are plenty of rich nuggets in these verses, more than could fit within this short article, so I will only focus on those that make my point. In the first passage, Jesus says that storms will come to everyone – wise or foolish. The house represents our life. We all have the choice of what kind of foundation we will build our lives upon and that foundation is either our way, or His way. He describes His way as a rock – immovable, firm, unchanging, while our way is likened to sand – unstable, constantly shifting, soft. The storms are the circumstances of this life – death, sickness, lack, and other forms of adversity. These are things we all face because we live in a fallen world. Though we are all impacted by troubles, if we build our lives upon the truth of His Word, we will not be devastated or destroyed. However, if we choose to go our own way, He declares our lives will face great devastation and ruin. Some of this can apply to our lives here on the earth, as well as our lives in the next age. The second passage is similar in meaning. The “full armor” of God are characteristics describing different aspects of Jesus’ ministry. He is the Truth (belt); He is our righteousness (breastplate); He is our salvation (helmet); He is our Prince of peace (shoes); our faith is in Him (shield), and the Spirit is our weapon (the sword/Word). To “put on ” the armor of God it is not some sort of mental exercise we go through daily for fear we will be unprotected if we forget. It means to walk in His ways – His character and nature. When we do this, He says we can then “stand [our ground].” The ground refers again, to our foundation. When we build upon the foundation of His ways, His character and nature, we can trust we will indeed stand, no matter who or what may come against us. And, even more importantly, He will be standing beside and around us for He dwells within us. Therefore, whatever we may be facing, we can have the assurance that He will bring us through it victorious, if we continue to stand on Him – our faithful, unchanging Rock. Have you ever taken the time to study and meditate upon the attributes of God? As believers, we often speak of, sing of, and mention His attributes in our prayers, but how often do we stop to think about what they mean? One of the primary ways we “see” God is by pondering His nature. The faithful do not quit, but finish what they start, “…being confident of this, that He who began a good work in you will carry it on to completion until the day of Christ Jesus.” (Phil. 1:6) Faithful ones remain faithful even when others are not. “If we are faithless, He will remain faithful, for He cannot deny Himself.” (2 Tim. 2:13) God not only acts in faithfulness, but His name is Faithful: “I saw heaven standing open and there before me was a white horse, whose rider is called Faithful and True.” (Rev. 19:11). These are just a few examples of the faithfulness of our God. He is constantly working in each of us to conform us to this same image. May we be found faithful even as He is! P.S. I will be having major surgery next week, so I’ll be taking a break from posting for a few weeks. May God bless you! According to the dictionary, faithfulness means: strict or thorough in the performance of duty; true to one’s word, promises, vows, etc. ; steady in allegiance or affection; loyal; constant; reliable, trusted or believed; adhering or true to fact, a standard or original; accurate. It implies qualities of stability, dependability, and devotion; long-continued and steadfast fidelity to whatever one is bound to by a pledge, duty, or obligation; unswerving allegiance to a person, organization, cause, or idea. Unfortunately, this compelling virtue is becoming more and more scarce in our society and even in the Church. It is not so surprising to see faithfulness vanish from our self-centered, self-serving society, but to see it diminishing in the Church is really inexcusable. 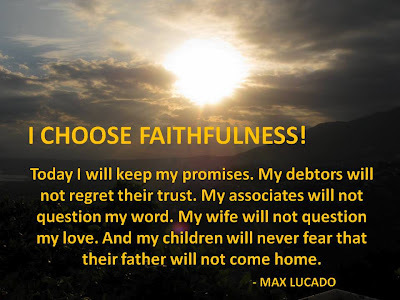 Faithfulness is one of the foremost characteristics of our God. It is a fruit of the Spirit. Even creation is faithful (see Psalm 85:11). In Scripture, faithfulness is often mentioned in conjunction with God’s love (see Ps. 117:2, 138:2; Prov. 3:3, 14:22, 16:6, 20:28 for just a few). In marriage, and any relationship, the two go hand in hand. If you love someone, you will be faithful to them. Unfortunately, dishonesty and unfaithfulness seem to abound in every sphere and level of our society, from government, leaders in the Church, athletes, celebrities, the medical industry, business and marriage partners, parents, etc. The repercussions have taken a devastating toll on our society: a fatherless generation who distrusts and thus, disrespects authority, adulterous marriage relationships, even in the Church, people who go from church to church looking for leaders they can trust, a nation of cynics and skeptics who don’t trust or believe anybody anymore, even when they are actually telling the truth. God’s people should be a reflection of His faithfulness to the world; however, we cannot do so apart from His empowering grace. We become faithful by meditating upon His faithfulness to us. Meditation upon His nature is the key to our becoming transformed into His image. If you want to be more loving, meditate upon His love. If you want more peace, meditate upon His peace. If you need more joy in your life, meditate upon His joy. If you struggle with faithfulness, I encourage you to try this simple technique. Find the Scriptures that refer to His faithfulness and read, study, and meditate on them. List the ways and times He has proved His faithfulness to you and ponder them. Ask for His grace to enable you to be faithful to Him and to others, just as He has been to you. He loves to answer these kinds of prayers. Let us represent Him accurately; let us be faithful even as He is. What is one way God has proved His faithfulness to you? Please comment below. The nature of God is a fascinating and complex subject. Though we are created in His image, He is wholly other than we are. His thoughts and ways are completely, radically different than ours. His perspective on everything is beyond our comprehension. His limitless wisdom and understanding far exceed our finite intellectual capacity. One of the great mysteries of His being is described as paradoxical. A paradox is defined as, “any person, thing, or situation exhibiting an apparently contradictory nature.” I will mention a few examples from Scripture. Jesus stated in Matthew 19:30, “But many who are first will be last, and many who are last will be first.” Again, in Matthew 10:39 He says, “Whoever finds his life will lose it, and whoever loses his life for My sake will find it.” In Mark 10:43-44 He says, “…whoever wants to become great among you must be your servant, and whoever wants to be first must be slave of all.” These Kingdom principles represent the paradoxical nature of our God. God is both a God of love and of justice, for He is both a Lover and a Judge. Psalm 33:5 says, “The Lord loves righteousness and justice; the earth is full of His unfailing love.” Many struggle with this seeming paradox. How can God love people unconditionally, yet judge them for their wickedness? Would a God of love really send people into a lake of fire for eternity? Yet, on the other hand, how can God be just and not punish the wicked? For those who have suffered great loss at the hands of evil, unremorseful, and unrepentant people, God’s justice is one proof of His love. Though He loves even the wicked, His justice will not let them go unpunished if they refuse to repent of their sin. This seeming paradox is not at all contradictory. You cannot have love without justice, nor justice without love; they are two sides of the same coin. To emphasize one aspect of His nature over the other is to seriously misrepresent Him. He is not just one or the other, He is equally both. God’s love and justice were both displayed on the cross, where His love motivated Him to pay the price that His justice required for our salvation. To all who believe on Him, this gift is freely and readily available. To those who refuse Him, their inability to live up to His standard of holiness will determine their eternal fate. This is not unloving on the part of Him who IS Love. Rather, He honors the choices each of us makes with the free will He has given us. At the end of this age when Jesus returns, He will come as Bridegroom, King, and Judge with justice in His heart to fully avenge His persecuted bride. (Rev. 5:9-10, 7:14-17, 19:11-21) He will make all wrong things right. We will judge beside Him during His millennial reign. (Rev. 20:4) Until that time, we must guard our hearts against offense towards Him so that we are not among those who will fall away from the faith. (Matt. 24:10, 2 Thess. 2:3) When His ways seem to be contradictory, we have His Holy Spirit to give us understanding and lead us into all truth. 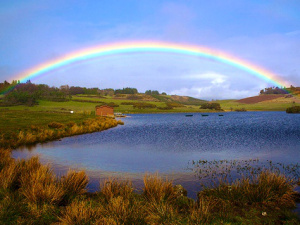 In what ways has God’s nature seemed paradoxical to you? Please comment below.